It was a dark and stormy night… no, wait – actually it started taking shape about three months ago and I really don’t remember what the weather was like. 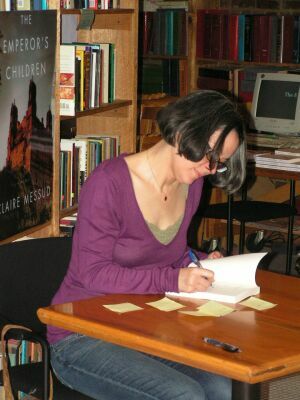 That was when I learned that Meg had written her second novel and was going to do a National Book Tour to promote it. I would finally have an opportunity to meet her in person! It took a little bit of searching and emailing, but with help from Claire Kirch (of Clair Kirch Publicity Services, Syren Book Company) and Vince Liaguno (freelance writer and author of the Meg Tilly interview that appeared in the October ’06 issue of “Autograph Collector” magazine) I was able to get the dates and locations that Meg would be appearing. Naturally none were scheduled for my area, but I’m not a stranger to traveling. I found one particular weekend when she would be doing readings on both Saturday and Sunday, and the locations were only about 75 miles apart. I knew right away that was the weekend for me… primarily because with two appearances I would have a “Plan B” should something happen the first day – but also because I would have TWO opportunities to meet her! October 21st finally rolled around, and my wife and I flew off to Seattle. I was so happy that Judy wanted to make the trip because this was going to be one of my big moments and I really wanted her to be there with me for the occasion. Also, she takes very good pictures and I definitely wanted photos! We arrived in Seattle that Saturday afternoon, and being Seattle it was dark and stormy… no, actually it was very beautiful and the weather couldn’t have been nicer! We settled in at our hotel, resting and freshening up for the evening. The time to leave finally clicked up on the clock and we were off for downtown Seattle. I was a little nervous about driving into the heart of a major city, but thanks to the Neverlost system in the rental car and a vacant public parking lot right across the street, we arrived at Elliot Bay Book Co. without event and (oddly for me) about 15 minutes early. Part of my anticipation included not knowing what to expect. I have never been to a book reading before, so wasn’t sure how big the event would be. I expected a much larger crowd because after all, here was a well-known celebrity making a public appearance – but there were only a couple dozen people milling around. I found out where the reading would take place and anxiously walked through the door, hoping at the very least for a good seat. Walked into the room, a million thoughts running through my head. My pulse was up and I remember experiencing a bit of tunnel vision. I made my way towards the seats that had been set up when an odd feeling came over me… Spidey Sense? ESP? I turned back to locate Judy when I realized … after all these years… I had walked right past Meg Tilly standing near the entrance of the room! To be honest, I really don’t remember what I did. I think I may have approached her, introduced myself, and shook her hand. I do remember thinking she was taller than I expected (about 5’ 7”) I also noticed the gray streaks in her hair, which may seem a negative thing but which actually made her seem more sophisticated and “real”. Yes! I did shake her hand because later Judy and I both commented on how dainty and ethereal her hand felt. Soft, dry skin – a mark of confidence when you consider she was about to stand in front of a room full of people to speak. Cool to the touch, with an extremely light, feminine grip. I was respectable and only held her hand for a few seconds. We spoke briefly (definitely don’t remember the words), she looking directly into my eyes, smiling, and extremely friendly. And then the moment was over. Judy and I found some decent seats and settled ourselves for the book reading. Meg took the stage and spoke for a few minutes about the book, how it began, problems getting it published, and confirming that “Gemma” as well as earlier “Singing Songs” were based on personal experience. Although I already knew this, there was still something of a sadness to hear her reveal this to us. And then, it was question and answer time. While I was deeply moved by Meg’s reading, this was actually my favorite part of the night because we got to see more of Meg’s real personality, humor, and demeanor. She speaks very well, didn’t stutter once that I can remember, and most of all comes across with honesty and integrity. Most of the questions naturally were about her book and her writing, but I did pick up on a few other subjects that might be more interesting to her general fans (you can read up on this topic on the main Meg page.) After answering questions for about 30 minutes, things seemed to slow down with everyone looking around at each other at which time my wife raised her hand, stood when Meg acknowledged her, and said “I don’t have a question, I just wanted to say Thank You!” – it was perfect timing, and to me was the perfect comment to sum up what we had experienced that evening. 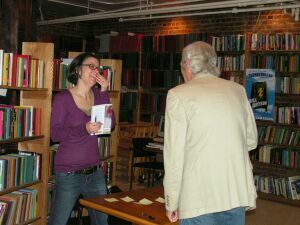 Next came the moment just about everyone had been waiting for – the chance to meet her and get an autograph. I wanted a couple more minutes to tell her about my web site, a thing that I was increasingly more worried about as I listened to her talking and describing her dislike of the public spotlight. But, it’s one of those things that simply had to be brought up because this would be my only chance to positively know what she thought about it. So, I waited at the end of the line, not wanting to cause trouble with anyone waiting behind me. Finally my turn came! She looked up at me; raising her eyebrows, smile on her face. The words didn’t come out as smoothly as I’ve practiced over the years, but the basic jumble translated to “Hello, Meg. For years I’ve waited for the chance to meet you in person, to shake your hand, and to tell you how much I’ve enjoyed and admired your work.” She graciously received my compliment, then extended her hand and said “then I think we should shake hands!” She then signed my copy of “Gemma”, writing a very nice inscription. I told her that I did have another question (the web site) but because I was nervous about her reaction, I asked her if it could wait until after we took our picture together. She laughed at my jitters, but cheerfully agreed. We posed, and I was completely surprised when she moved in close and put her arm around my waist! In the picture, I’m sure you can see my nervousness, but I did put my arm around her shoulders. Flash, and the moment was caught for all time! After the picture, she reminded me that I had another question. 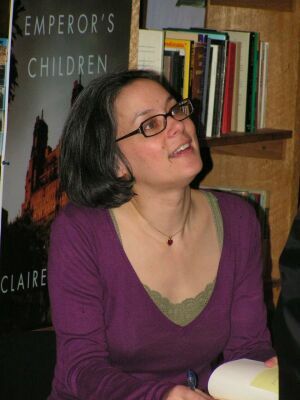 So, I told her that I have been hosting the web site – the Meg Tilly Homage page – for a little more than twelve years. In all the mind-scenes I had played in my head, I thought I had imagined all the possible responses. So, I was completely surprised when she laughed and said “You have a WHAT? ?” I explained as quickly as I could, and she just kept laughing and finally said “well, thank you?” Not knowing what else to say, I just said I was happy to do it, shook her hand once more, and that was the end of our evening. I can’t express what I was feeling other than satisfaction and happiness, but there really was so much more. As we drove back to our hotel, Judy and I were discussing the night and I suddenly realized that I had forgotten one of the main things I had intended to do, a big deal to me as host of the Meg Tilly site. Over the years, I’ve had problems with the Guestbook on the site or simply had to reset it when the entries got to be too many. But, I’ve kept all of the comments everyone has made and before going on the trip I printed them all out. I felt something of an obligation to the fans and visitors to take this opportunity to once and for all know positively that Meg would be able to read everyone’s comments. Plus, I thought it was important for Meg to know just how many people from all over the world have enjoyed her work. But, in the excitement, I forgot to bring the documents with me! 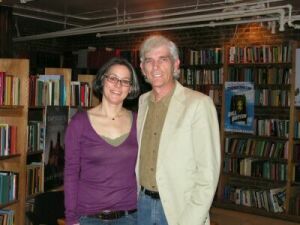 Luckily, Meg was doing the other book reading in Bellingham the next evening (remember Plan B?) and also… somewhat to my surprise, Judy was all for driving up to see her again! As much as I wanted to go, I did feel it would be a little odd to show up again but now I had a reason and Judy’s support! Also, one other big benefit would be the possibility to meet Mark, another long-time Meg fan who was hoping to attend the Bellingham appearance. So, Judy and I spent the day playing tourist and seeing a little of the Seattle area, then made the beautiful drive up north. Oh, during the day I had the idea to have the pictures we’d taken the night before printed and hopefully get Meg to sign them as well. Bellingham. Again we arrived early and found Village Books with no problem. Judy wanted to look around the stores for some souvenirs and I went to find where the book reading would be. As I headed for the counter, I spotted a familiar profile... it was Meg! She, too, was there early to get set up and when she spotted me, she remembered me from the night before. I said something goofy about “now you must think I’m following you” and we chatted about how impressed Judy and I had been the night before. I also presented her with the Guestbook comments and explained what they were, and she seemed a little impressed and grateful for having them. I then showed her the pictures (one of Meg and myself, one of her with Judy) and asked if she would mind signing them for us. She was happy to (and luckily I had brought a Sharpie with me!) and generously signed both pictures for us. Meg had to go for her reading, so Judy and I went into the room and found our seats. Not as good this night as surprisingly there were quite a few more people than there had been in Seattle. This time as she read, I watched her more as I listened than I had the night before and was quite impressed by the way she would change as she read each characters part. Again I had tears welling in my eyes by the time she finished, and again I was moved. 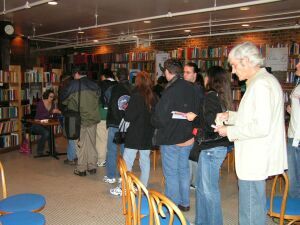 After the question & answer period when people started lining up for autographs, Judy and I made our way out. We’d had our moment the night before so didn’t want to impose again. But, I did wait by the entrance of the room hoping to meet Mark… which we did! Mark had brought his girlfriend, Patty, and they both seemed almost as moved as I was. And then, it was time to leave. After over twelve years, my “dream” had finally come true. I found myself wondering where I would go from here since reaching this moment had really been the force behind so much else I’ve done (read the “Web Site History Page”, also linked on the Meg Tilly home page.) Remember the papers I’d given her with the Guestbook comments? Well, in that envelope I included a short note in which I tried to better explain who I was and what the web site was all about. I included my contact information (should she decide she wants me to close the site) so… there’s still a teensy bit of hope for further contact. That is enough for me, although I think many other things are going to change such as my autograph collecting. Doesn’t seem to be much point in it any more. Also, I want to help support Meg with her books in any way I can, so that will be a pushing force. To understand why this is so important, you’d really have to read her books and if at all possible, attend a reading. Thank you for spending the time it took to read this. I know I can be long-winded, but I wanted to share as much of the experience with you as I could, not to mention it’s a joy for me to relive the moment. Meg Tilly is everything I had imagined, and so much more. Her conviction is quite evident, but what may be less obvious is the huge amount of courage it must have taken her to write her books and to “come out” with the fact that she and her siblings suffered the cruelty and abuse described in her stories. She much prefers an obscure life, away from the reporters and flash-bulbs, but pushed that aside knowing what she’d be subjecting herself to in order to personally promote her book. 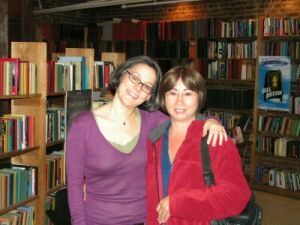 Meg Tilly, thank you for your courage and your talent. You have truly made me see things in a different way, and from the bottom of my heart I wish you and your family all the best.